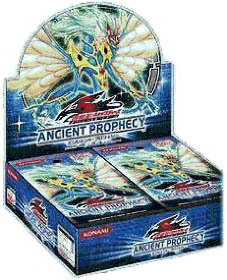 Each Ancient Prophecy booster box contains twenty-five booster packs and each booster pack contains nine cards. The set features cards from the Yu-Gi-Oh! 5D's anime, including earthbound Immortals, along with cards used by Yusei Fudo, Luna, Leo, Crow, Rally, Lazar, Carly Carmine, and Greiger. Introduces Jester and Fortune Ladies archetypes and includes support for the Koa'ki Meiru archetype as well as further support for Blackwing cards.